In this tutorial, we will be focusing on setting up our coding environment. Before we start, this is one of those parts geared for Mac users. If you run Windows, google Wuppy29, and look at his tutorial. To start, we will need a few files. First, we will download Eclipse. Download “Eclipse IDE for Jave EE Developers”. After that has finished downloading, we will need to download Minecraft Forge. The file you need will be whatever version of Minecraft you are modding. Download the Latest Version of Forge, but you have to get the one that says "src", which stands for source. Any other version besides the src will not work. After these commands have been run successfully, Forge should be fully setup. Open up Eclipse, and a window pops up. Press Browse and navigate to your folders (forge > eclipse), and press enter. Eclipse should open up, and to the left, you will find a Minecraft folder. If you see this, you are good to go! If you don’t, leave a comment for me or others to help you. Wanting to release a mod? Simply type "./gradlew build" in terminal in your forge folder's directory. Few tweaks to the thread. Note: If you want to release a mod, simple type ./gradlew build in terminal in your forge folder's directory. That will setup your dev workspace. Execution failed for task ':recompMinecraft'. See if those two commands work instead. I tried and got this. must mine craft be on the latest version of forge 7.10? No, I use Java 6 as well. Java 6 may limit you in some areas, but so far, I haven't experienced any. Any other advice for how to solve this problem? What version of forge are you using? I've had some issues with newer versions of forge as well. Try 1208. The version of forge i am using is the 1.7.10 recommended version. I also checked do i have to use the eclipse for Java ee developers? I just ran the last two codes and they worked i have yet to try to run it on eclipse yet so i'll try it. 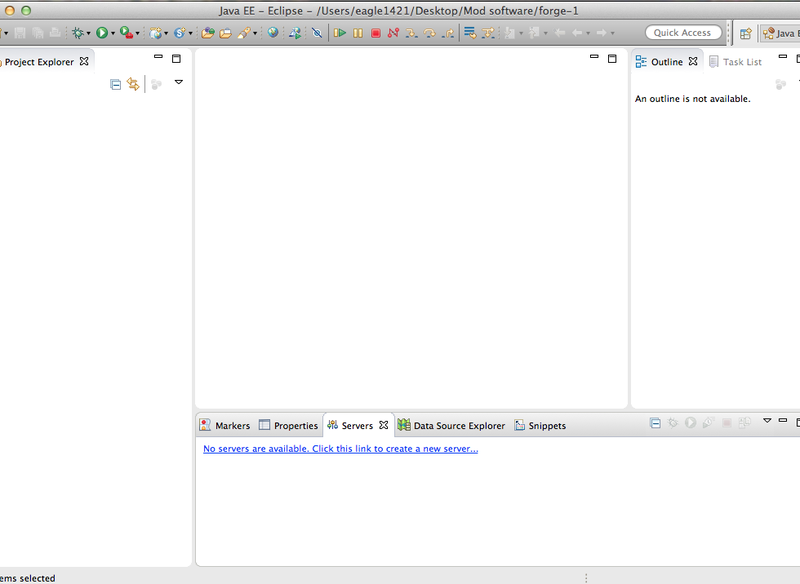 here is the log see if there is a difference because i just downloaded eclipse for java ee development. There might be a difference. I would go ahead and use the one for EE Developers. Not sure why, probably something is in the EE one that isn't in the normal one. I ran eclipse and there was no minecraft file any hints? Your sure you didn't go to the wrong location? Well i went to my eclipse start up and dragged the forge folder into the eclipse workspace that is what you should do right? I also have more than 1 eclipse downloaded , will that have any effect asa well to the set up?